Harper’s Bazaar is launching a membership program to help stylish women plan their wedding, building out from the Weddings vertical created three years ago. 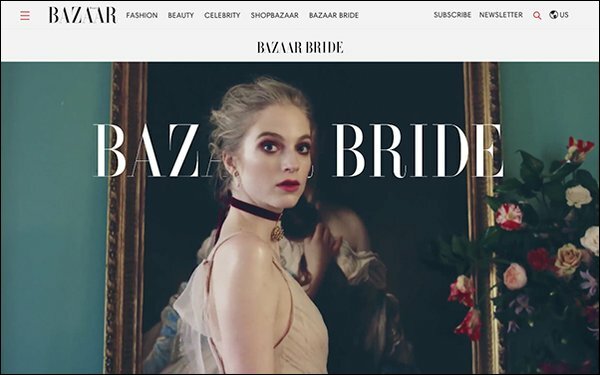 Called Bazaar Bride, the program will cost $90 and include 12 weekly digital editions of bridal newsletters, 15 masterclasses with celebrity experts, over 15 exclusive shopping deals, a members-only video series and a one year subscription to the new Bazaar Bride online vertical. Consumers can also purchase a website-only subscription with access to Bazaar Bride's online content for $5 a month. The site features editorial such as trend reports, ideas for wedding planning, decor, fashion and accessories, and coverage of real weddings. “When a woman got engaged, her mother, sister, best friend would give her a stack of wedding and bridal magazines. This is that stack, but elevated, curated and digital,” Carrie Goldberg, digital editor, weddings and travel at Harper’s Bazaar, told Publishers Daily. The stand-alone membership offering is being overseen by Goldberg, who launched the Weddings vertical on Bazaar.com when she joined the title about three years ago. “We were looking at analytics for that vertical and realized the audience is particularly sticky: 29% of the reader base comes back four times or more a month. We wanted to create something special for people coming back again and again to us for weddings,” Goldberg said. Bazaar Bride will provide information from dress shopping to centerpiece ideas, she said. When a reader subscribes, they get the introductory issue of the newsletter, and continue to get issues once a week for 12 weeks in their inbox, to “keep viewers engaged on a weekly basis, but on their schedule,” Goldberg said. There are no advertisers in the newsletters, which will cover wedding planning, fashion, accessories, beauty, florals, decor, registry, photography, music and food, among other topics. The master classes will feature celebrities like chef Wolfgang Puck, royal wedding makeup artist Daniel Martin and celebrity stylist Micaela Erlanger. “Our hope is that our team updates the content to remain relevant. Shopping content will update regularly by season, we will add more master classes, and more deals and discounts that you can’t find anywhere else,” Goldberg said. The deals were chosen by editors as “top picks for a bride’s year of splurging,” Goldberg said. They will range from products and services such as jewelry, accessories, travel, stationery and decor, and valued up to $25,000. The video series will feature advice from personalities like Vera Wang on fashion, Putnam & Putnam on floral design and John Dolan on photography.